If you’re feeling excited about an upcoming move, you’re not alone. Moving into a new home represents the chance to welcome exciting changes into your life, and an opportunity for growth in a positive direction. However, as inspiring as a new home can be for everyone in the household, moving into it can be quite exhausting. The toll that moving can take on the family can set everyone back both mentally and physically before, during, and after the move—which is why professional moving and storage solutions are recommended to make the process easier to manage. At Arnoff Moving & Storage, we know exactly how tough moving can be on the family. We take our role as one of the most trusted family-owned moving and storage businesses in the country very seriously, and have almost a century of experience providing top-quality moving solutions for customers all over the world. Our goal is to provide our customers with everything they need for a smooth, worry-free moving experience, with a full range of custom storage options including household goods storage, mini self-storage, portable storage, and so much more. If you’re planning a move and wondering how storage can help, take a look at this article to learn more about the benefits of using storage services during relocation. Just as moving services have improved over the years, storage solutions have evolved as well. Now more than ever, storage warehouses are equipped with special features and customization options designed to suit the needs and preferences of customers on an individual basis. · Short-Term Storage Options: Storage is a perfect option for short-term needs, such as during a temporary move. Some job relocations or other circumstances are not designed to be permanent and moving might be tentative or only temporary. However, maintaining two residences isn’t an option for most people, and short-term storage can be an effective solution. · Clutter Management: It can be tough to separate ourselves from all of the things we accumulate over the years—and nothing can bring this fact more to light than a move. If you’re currently struggling to lighten your load before a move, place items you don’t use or that you’re not sure about into storage instead. Doing this can help you to realize what you truly miss, and what you really don’t need. 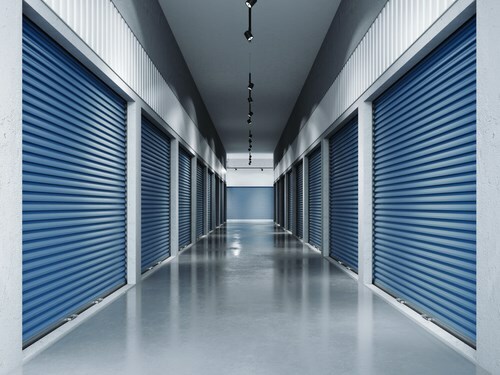 · Security and Accessibility: Many storage companies offer their customers with 24/7 access to their belongings, which can be quite convenient and efficient during the moving process. It’s also important to mention that greater accessibility doesn’t mean low-quality security. At Arnoff Moving & Storage, for example, our storage facilities are equipped with access code entry, top-of-the-line video surveillance, and round-the-clock security team for the safety of our customers and their belongings. Personalized storage options that are suited to fit the requirements of the customer can be quite helpful during relocation. A reputable moving and storage company like Arnoff Moving & Storage can provide solutions to match your requirements during a move with a range of services designed especially for you and your needs. · Portable Storage: Portable storage solutions are perfect for those in need of greater flexibility during a move. Customers can set the date for a portable unit or units to be dropped off wherever they’re needed, and can schedule for pick-up at their convenience. · Indoor: Inside storage is best for protecting your belongings from the elements. It’s also very convenient for loading and unloading in a dry environment, no matter what the weather is like outside. · Outdoor: Outdoor storage is usually reserved for larger items—like vehicles, furniture, and more. Unlike indoor units, outdoor units are susceptible to weather and temperature changes. If excessive cold or heat are concerns, other options may be better for you. · Climate control: Climate-controlled storage spaces are perfect for storing sensitive electronics, artwork, alcohol, and other items that are susceptible to high or low temperatures, humidity, and weather. · Full service: For unmatched convenience and service, consider a full-service storage option. Facilities that offer full-service will pick up your belongings and transport them to their local facility for you, and return them whenever you need them. Arnoff Moving and Storage is proud to offer full-service moving and storage services in New York's Hudson Valley, Massachusetts, Connecticut and Florida, and in many other states across the country. Our mission is to help our customers enjoy the moving experience, with a comprehensive range of superior solutions designed especially for you. We’d love to help you explore your storage options in time for your next move! Give us a call to speak with one of our friendly agents, or get started now with a free, in-home pricing estimate by filling out our online form.